VLOOKUP is one of the most popular, useful functions in Excel, but it’s hard to remember the formula if you don’t use it that often. To download a reference card that explains what the arguments mean and how to use them, click the link below. 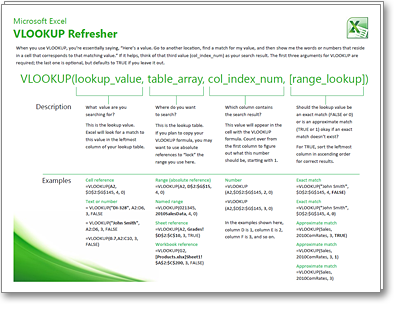 The VLOOKUP reference card opens as a PDF file in Adobe Reader. Feel free to print a copy of the card, or save it somewhere on your computer to refer to later.